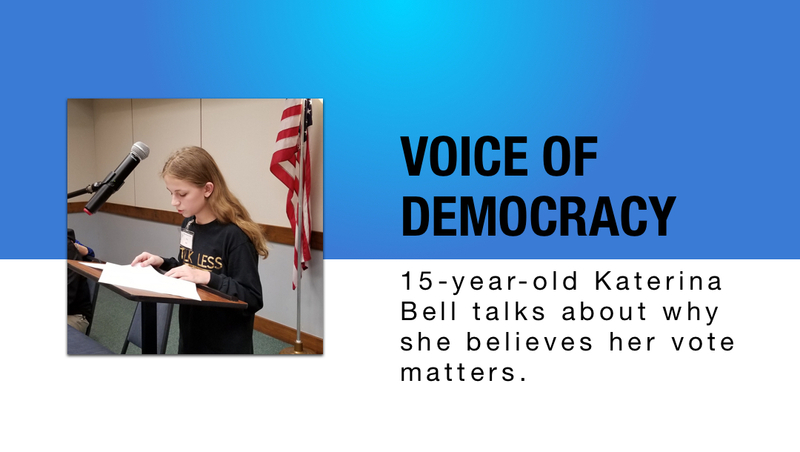 15-year-old girl Katerina Bell talks about how her experience at a political rally changed the way she thinks about voting. I am a 15 year old girl in a regular town with regular friends and a regular school. I have many interests such as dance, choir, and musical theater, you know, the things many young women enjoy. I hope to attend college in order to work in a field that observes and protects a variety of wildlife because I have a passion for animals. I can see my place in the world, yet I hadn’t really thought about how important voting is since I am not old enough to vote. Like Marshall McLuhan said, “American youth attributes much more to arriving at a driver’s license age than a voting age.” This was true for me…until now. One day, I was watching the news and heard a story about how changes in environmental laws can affect the migration patterns and the life span of animals in a particular region. This caught my attention very quickly. As I watched and listened, I began to cry. I felt powerless. I wanted to help save these animals, but I didn’t know how. I decided to attend a political rally and meet some of the candidates who would possibly be voting on these laws. I didn’t care if they were Republican or Democrat. All I wanted was to use my voice to express my opinions and concerns to people who had power to alter the course of these proposed environmental changes. When I got to the rally, there were all kinds of people giving a variety of speeches. I heard people talking about Constitutional rights in many ways, including immigration, gay rights, freedom of religion and standing against hate. I found some representatives what were campaigning and I voice my concerns to them. Amazingly, they were very interested in what I, as a young person, had to say. I told them my platform was to save the animals and I wanted a variety of them to be alive when I graduate college. The best thing about this encounter with the candidates was that I saw them as real people, too. As I listened to their responses, I could see how important it is that we become a part of the democratic process and, when we are old enough, that we vote. Just like Mahatma Gandhi said so eloquently, “You must be the change you wish to see in the world.” At that rally, my voice was heard and perhaps, it may have changed an opinion with one of my representatives. After this encounter, I attended other rallies and even spoke at one. I figured since I can’t vote yet, perhaps I can persuade people who are old enough to help ensure the safety of the animals. I think I may have changed a few minds. Now, as I think about voting, my thoughts have expanded. I understand from listening to the people at the rallies and participating in endeavors to persuade voters, that our opinions and our votes really matter. I watched teachers marching for higher pay. I listened to veterans talking about health care. I heard people addressing homelessness. I saw people registering others to vote. I can see how we can work together to make our world a better place by participating in the democratic process. Our veterans have fought to defend our American life and our Constitutional rights. The most powerful right I will have is my right to vote. In the words of John Lewis, “Too many people struggled, suffered, and died to make it possible for every American to exercise their right to vote.” I refuse to be indifferent. I have power and I will use my power, my voice of democracy, and I will vote. My vote matters. Outstanding! I had the blessed opportunity to encounter this young author during many rallies! I am amazed and impressed at how brilliantly she makes this argument! To the future!